This letter was written, with a donation enclosed, to Ms. Berry to inform of ongoing fundraising efforts for the Berry Schools. 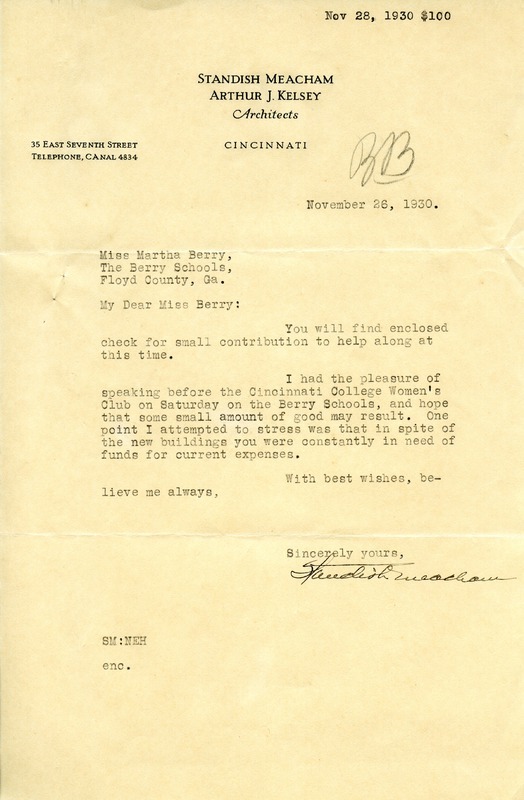 Standish Meacham, “Letter from Standish Meacham to Martha Berry.” Martha Berry Digital Archive. Eds. Schlitz, Stephanie A., Sherre Harrington, Christy Snider, Meg Ratliff, Christopher Haley, et al. Mount Berry: Berry College, 2013. accessed April 20, 2019, https://mbda.berry.edu/items/show/13382.